We are proud to be the exclusive TEDxBeirut communication and design partner. The TEDxBeirut website is designed around a simple premise. There’s the website, and there’s the community. Most websites, including those of other TEDx events are isolated from the community. A member of the community eventually visits the website, takes a piece of information, and leaves. We changed this. What’s unique about this area is that it has Facebook comments fully integrated and unique to each page. For example, as we’re adding a bio on a TEDxBeirut speaker, the community is discussing the speaker, voicing their concerns, and sharing each others thoughts and ideas. In as close to real-time as possible, the TEDxBeirut social media team, in partnership with SMEX, is answering questions, revealing new info, and noting down suggestions. All of this interaction is posted to Facebook in parallel. 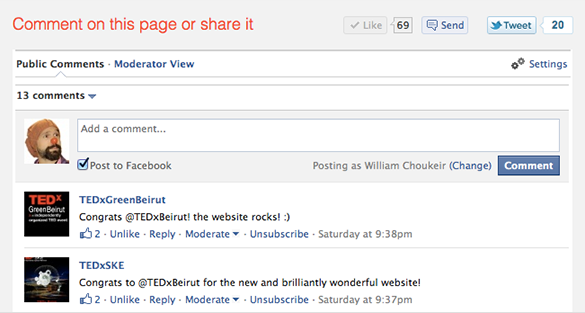 All replies from within Facebook, automatically appear on the matching TEDxBeirut webpage. We understand that a few people have reservations about Facebook comments. We could have implemented other commenting systems, yet we didn’t want to impose a tool on our community, thus alienating them. The majority of our TEDxBeirut community is mainly on Facebook; we wanted to give them the tool they naturally use most. You don’t need a Facebook account to comment, and you can choose not to post your comment to Facebook. 3. Book worms can read every word from start to finish. This is so true and so beautifully said. Reading your post is like an energy boost. Thank you. Why don’t you speak about the true Facebook private politics ? It’s absolutely impossible to delete an account !! They collect all your datas and will never delete them… Personnaly, i just hate FB.